We’re very proud and happy to announce the arrival of Aurick Blair Suess. Unfortunately his mom’s labor didn’t go very well, so after 28 hours of hard labor he had to be delivered by c-section. 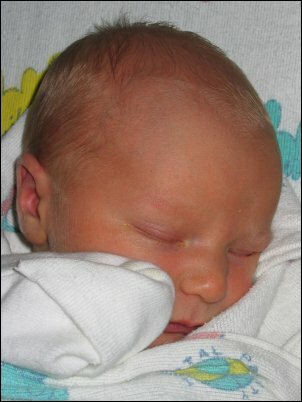 He made his arrival at 8:10am on September 6 and weighed in at 8lbs 5.4oz and measures 21 ½ in. He and mom are very well; they’re resting at the hospital and will most likely be coming home on Tuesday afternoon. The little guy seems to be very happy, healthy, and quite strong. Right after he was delivered, I went over to the cleaning table to console him, I placed my finger in his hand and he immediately squeezed with enough strength to startle me. After we got him cleaned up, I got a chance to hold him and then took him over so his mom could see him. To that point he had been a bit fussy, but once I put him next to Tam and she spoke to him, he immediately became very quite and opened his eyes wide. He obviously recognized her voice and was as curious to see her for the first time, as she was to see him (see attached photo). I know most of you are probably curious about his name so let tell you a bit about it. When we began our search for a name we had two criteria, we wanted something from our heritage (German, Scottish, Norwegian), and something unique. After a long search we decided on Aurick, which is a German name which means protecting ruler. We’re pretty sure he won’t meet more than two or three other boys with the same name during his lifetime. His middle name, Blair, is his maternal grandfather’s surname.